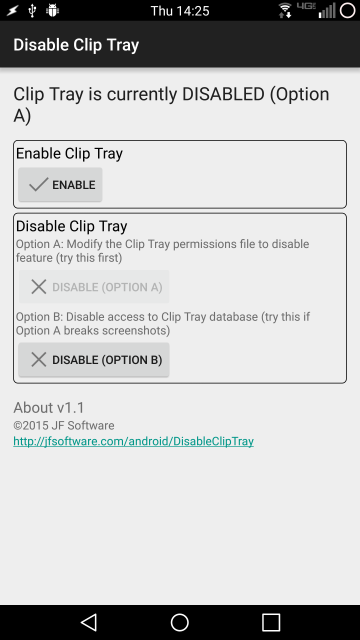 Simple app that allows you to enable or disable the Clip Tray feature found on many LG Android phones. Option A: Comment out the section of the /system/etc/permission/com.lge.software.cliptray.xml file. Option B: Remove the /data/data/com.lge.systemservice/databases/clipdata.db and /data/data/com.lge.systemservice/databases/clipdata.db-journal files and replace them with folders. Users have reported that Option A can break the ability to take screenshots; if this happens, try Option B instead.